FULTON, NY – The Child Advocacy Center of Oswego County is offering country music fans the opportunity to win a once in a lifetime ‘Single Barrel Experience’ that includes two premium reserved seats in the first 20 rows to the Chris Stapleton concert, July 16, at Darien Lake Arts Center. Todd Engel of Engel Law Offices in Syracuse and Saratoga presents Karrie Damm, executive director of the Child Advocacy Center of Oswego County with a V.I.P. package, valued at $398, to the upcoming Chris Stapleton concert on July 16. 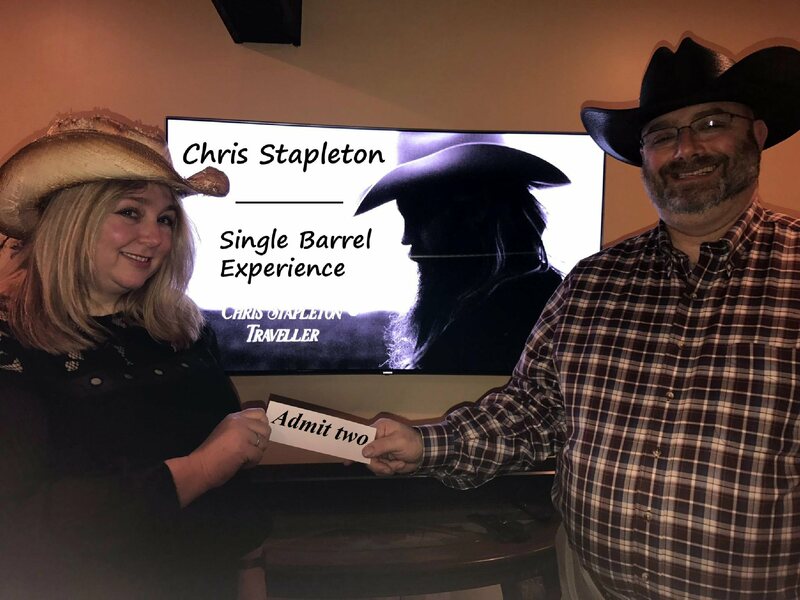 This VIP Package includes an invitation to ‘The 78’ Pre-Show Lounge and Interactive Experience featuring an unprecedented opportunity to take photos holding county music superstar Chris Stapleton’s most iconic awards as well as hold/touch/view instruments and memorabilia from Chris’ Career (only available to VIP guests and guests of Chris Stapleton). One of the biggest names in country music, Stapleton received numerous awards in 2016 including; the Academy of Country Music Album of the Year for Traveller, Male Vocalist, New Male Vocalist, and Song of the Year for Nobody to Blame; Country Music Association awards for Male Vocalist and Video of the Year; and the Billboard Top County Album award. The singer / songwriter also received Grammy Awards for Best Country Solo Performance and Best Country Album. The CAC will award the tickets during a special drawing at its sixth annual Wing Fest to be held March 10 at the Lake Ontario Conference Center in Oswego, but winners need not be present to win. “This is an opportunity for community members who do not attend Wing Fest to still participate in this terrific fundraiser and win a wonderful prize,” said Damm. Tickets for the drawing are only $25 each with a limited number of tickets available. Damm said that the tickets and V.I.P. package for two is valued at $398. Tickets will also be available during Wing Fest up to the time of the drawing. To keep the odds of winning competitive, only 1,000 tickets are for sale and are available on a first come first serve basis. All proceeds from the drawing and Wing Fest benefit the CAC, a non-profit organization that works hand-in-hand with local law enforcement, prosecution, child protective services, medical providers, mental health providers and victim advocacy professionals in Oswego County to protect and serve child victims of sexual and physical abuse. In 2016, the CAC served 500 children and families in Oswego County. The CAC’s main office is located at 301 Beech St. in Fulton; there is also a satellite office at 4822 Salina St. in Pulaski. For more information contact the CAC at 315-592-4453, visit www.oswegowingfest.com or follow the Child Advocacy Center of Oswego County on Facebook.